Your debt to income ratio is like your first impression on a date: its a key factor for a lender to decide whether or not to grant you approval for a mortgage or a loan. If it's too high, you'll be looking for another date with a lender. But don't worry, this ratio is not complex and it is easy to understand and calculate. Your DIR is the ratio between how much you owe each month on personal debt and how much you earn. Take that total amount and divide it by your monthly gross income. Don't forget to include your spouse's income after taxes. Better yet, use our FREE Debt to Income Ratio Calcultor and get your ratio fast! When shopping for a mortgage, it's good to shoot for a ratio of 36% or lower. Anything over that figure will almost guarantee you denial of credit or a higher mortgage interest rate. This could hinder your attempt to pay off your mortgage early (which we don't suggest you do anyway). But the lower the interest rate, the better. Experts also suggest that no more than 28% of your monthly gross income go to paying housing expenses (mortgage payments, private mortgage insurance, homeowners insurance, property taxes). There are a couple of ways to go about this. One strategy is paying off debt. If don't have a budget, or don't know what one is (yikes! ), get some budget help. We have some budgeting tools on hand to help you decrease debt and give you a snapshot of where your money is being spent. If your housing expenses are too high, consider refinancing your mortgage or taking out a home equity loan. One thing you might want to think about are interest only mortgage loans. As for credit cards, increase your credit card limit and decrease your interest rates at the same time. These can lower your monthly payments and increase your FICO score. A way to increase income and enjoy it at the same time is learn how to earn or make online money. You can earn a substantial amount of income providing information about your passion to an audience online. SBI helps us do this everyday. What's great about SBI is that you don't have to be an Internet marketer, a prolific writer, or even Internet savvy to succeed online. 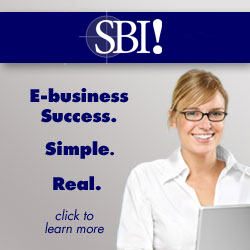 Just bring your passion and knowledge...and SBI will help with the rest. Whether you use our debt reduction strategies or take measures to increase income, or both, take steps to get your debt to income ratio within the recommended percentages. Use the tools we've given you to make the changes. Change is good...when it helps you save money. Return from Debt to Income Ratio to Personal Debt Management. Return from Debt to Income Ratio to Choose Financial Freedom.